Series 1000 Door Monitor Systems from CORNELL offer you a unique combination of high quality construction and options that are virtually limitless. Down to the last components, the Cornell Series 1000 Door Monitoring Systems has been built for performance over the long haul. We use only solid-state door monitor panels, for example. LEDs instead of incandescent lamps. And faceplates of rugged anodized aluminum. 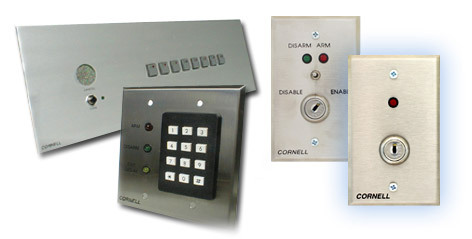 The Cornell Communications Door Monitoring system provides senior and assisted living facilities with a wealth of unique options and custom features capable of integrating with your emergency communication systems, which means your Series 1000 Door Monitoring system is sure to deliver trouble-free performance, year after year. The master panel controls and monitors each door in the system constantly--including exterior, stairwell, and individual room doors. During the day, the main entrance is left open and disarmed, as are the doors to individual patient’s rooms - a status signified by steady green LEDs. Should any entrances or exits be opened by an unauthorized individual, emergency notification light begins flashing and an intermittent tone sounds at all master and remote panels. Should a second door be opened before the first is investigated, an overriding tone sounds (Naturally, these tones can be muted or silenced for noise-free applications). Changing the status of a particular door is as simple as touching the right zone switch on the master panel for this installation. However, it can be as complex as requiring the insertion of a key at this panel, or at a remote station. The configuration you specify will depend upon the number of functions required in a given application. Remote control and monitoring panels are available for the Series 1000. For remote control applications, your door monitoring system function may be complementary to the main panels, or easily transferred to assume exclusive control of all doors in the system. The Cornell Communications Door Monitoring Series 1000 System offers you a wide range of expansion and integration options. So it’s a cost-effective solution for applications involving as few as two or three doors up to systems involving hundreds of doors. Cornell Communications specializes in quality door and window monitoring systems for the healthcare fields. Hospitals, assisted living centers, and hospices everywhere use wireless door monitoring for security purposes. Use this emergency communication device to warn others when an unauthorized individual opens a door or window. This manual provides crucial details on our 1000 Series door monitor system’s annunciators, power supply, and zone control. The annunciators are used for volume control and mute. The aluminum surfaces are available in multiple or four zones. Choose from a 12 or 24 volt power supply in one or three AMPs. The zone control features a keypad station, time delay remote, and remote zone control. When you are ready to secure the doors and windows in your organization, trust our door monitoring systems. Browse our annunciators, power supply, and zone control components to fit your very own door monitoring systems. Cornell Communications has provided unmatched emergency call systems for forty years. Our nurse call systems are designed with advanced technology to serve a variety of needs. Cornell Communications is a proud supplier of 1000 Series Door Monitoring Systems for hospitals, assisted living centers, hospices, and nursing homes everywhere. Our door monitoring systems are used to warn others when a door or window is opened by an unauthorized individual. Count on this innovation for extra security at your organization. This manual provides everything you need to know about operating and assembling your own door monitoring system. The operations and specifications page provides system features, remote control zone information, and wiring directions. The 1806 and 1808 remote control documents detail programming instructions. Download these easy to read documents to learn how to use this door monitoring system for your organization.